Now I know Sephora shipping to the UK is old news, but I've only been living here for just over 2 months so for me it's definitely new & exciting. Not to mention a huge temptation! So far I've managed to keep everything in the basket and not hit checkout yet, but who knows for how long it will stay that way. These are all "want" products for me because lets face it it's not like I need more makeup. (even if in my mind I think I do). 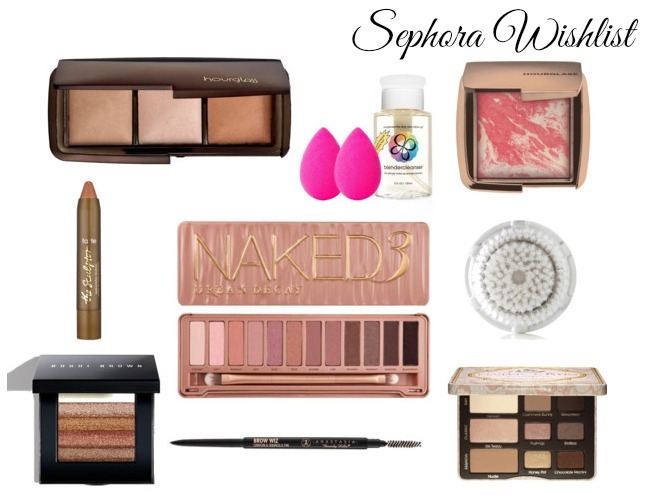 Anyhow it's fun creating wishlists and dreaming of new products, which is why I decided to share with you my Sephora Wishlist. Hourglass have managed to sneak their way in there with two products. I have been reading about hourglass for over a year now and my "need" to try these beautiful products is increasing everyday. First up is the Hourglass Ambient Lighting Palette, which was originally brought out as a limited addition palette. Now that its back on the market for good I want to get my hands on it and experience the amazing powders everyone's been raving about. The other product is the Hourglass Ambient Lightning Blush which is just gorgeous to look at and from reviews it also looks great on. It took me forever to decide which shade of blush I would like to have and I chose to go with Diffused Heat as it's a little bit different to anything else in my stash. Both products look so luxurious and I hope to get my hands on them soon! Urban Decay Naked 3 had to be included, as it's a product I've been lusting after for a good while. I previously owned the original Naked Palette and got good use out of it for a while, but once the MAC Palette entered my life it got shoved to the side and stayed untouched for months. With that I decided to hand it over to my sister who is giving it a lot of loving! The beauty addict in me now wants to replace it with the Naked 3. The other eyeshadow palette that made an appearance on this list is the Too Faced Natural Eye Neutral Eyeshadow Collection, because you can never have too many eyeshadows palettes right? *I'll pretend it's true*. I've never tried anything from Too Faced before and this looks like the perfect product to experience from this brand. I've seen it popping up everywhere and it looks like a great palette for everyday wear. The only thing I actually need from this list is this new Clarisonic Luxe Facial Brush Head (from the Cashmere Range). I've had my Clarisonic since January now and although I don't use it the recommended twice a day, the current brush head definitely looks like it needs to be replaced so this purchase will have to be made in the next few weeks. Beautyblender is another product I have been wanting to try for a really long time, but just couldn't justify paying that much for essentially a makeup sponge. Instead I've tried to curb my temptation with the cheaper alternative from Real Techniques. Now that I've had a taste for makeup sponges and fallen in love with the flawless application, I want to try the 'real deal' more than ever. This set of two Beautyblender sponges with a cleanser seems like the best pick. Bobbi Brown Shimmer Brick in Bronze is another product I couldn't justify the price for. I have been so close to buying it on multiple occasions and managed to talk myself out of it *damn the sensible side of me*. The product is just gorgeous and I've seen how it beautifully highlights the face, so I still very much want it in my life. The next product is this Tarte Sculptor, which is something I've only come across recently through Lily Pebbles blog. It look like such an easy way to contour and get those cheekbones to pop. It would also be the first Tarte product in my life and an affordable one (compared to the rest of the list). Last but not least is the Anastasia Beverly Hills Brow Wiz because I still haven't mastered getting my brows just right. 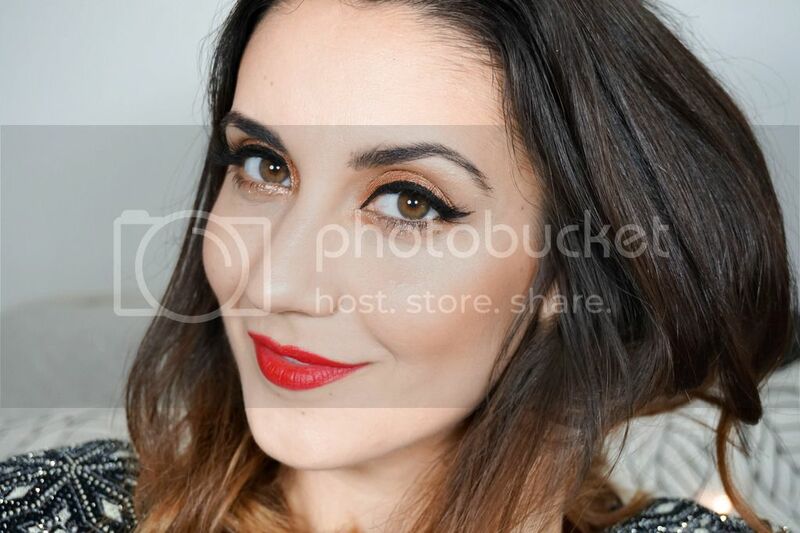 This product has been raved continuously by the blogging community and I feel like I really need to get my hands on it in order to master the brows. So even though this is my wishlist, I've managed to cut it down to a sensible 9 products for now. Not a whole lot if you really think about it *I'll keep telling myself that*. Do you have any of these products or do you lust after them like I do? I don't mean to be a terrible enabler, but the Brow Wiz is such a must-have, and you will totally master your brows with it! I also have and love the Ambient Lighting trio and the Shimmerbrick, and love them both! Much as I love the Naked 3 (and I really do) I reckon I still use 2 the most, so if you're going to splurge, I'd say go for the Shimmerbrick, it's so lovely! In love with the packaging and the shades for all the too faced eyeshadow palettes! So gorgeous! That hourglass palatte looks pretty amazing! Can I have one of each of these things please?! I love all of these! I love the Naked palettes (I have 1 and 2) and I wanted to get 3 as well but after seeing your MAC palette, I thought I might splurge on one of those instead! I really want to try the beauty blender as well as I love my real techniques sponge.